The Immersion Research Arch Rival Drysuit. I have had a bit of an on/off affair with using drysuits for paddling of late. The first suit I bought, and still have, is my Typhoon Multisport 3. For the money it is a fantastic piece of kit. It is strong and durable and the quality is superb. The convenience of being able to take a drysuit off at the end of a days paddling and not have to do the ‘towel dance’ to get changed in cold, wet, windy weather is worth the price alone. However in the last couple of years I have been wearing separates, preferring the lighter, less restrictive setup of a cag and dry trousers. 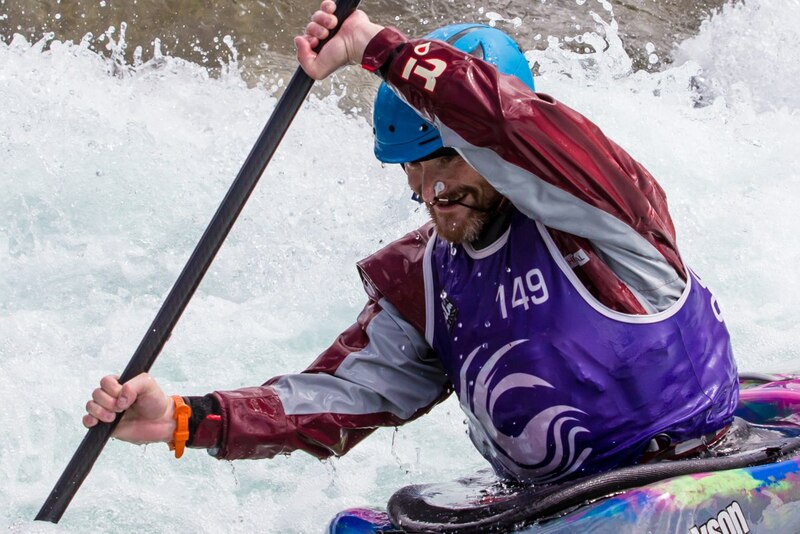 One of the main problems I have with the Multisport drysuit is the zip. I just don’t like the zip. It is easier to do up on my own than most other rear zips, but it is bulky and it is a pain to get my BA over. I also find that the material, while tough, is a little heavy, especially when it is wet. So combined with the fact that I have been taking proportionally less swims on rivers these days (I’ve gone and said it now, haven’t I?!) and I have preferred to put up with some dampness and use separates. After all it is white water kayaking, and getting wet is part of it! I have now taken the plunge and I have purchased a new drysuit. Why? Last year I tried a Kokatat Idol drysuit that fixed together at the waist, making it feel more like a cag set up. In fact so well cut and so light was the suit that it didn’t feel like I was wearing a drysuit at all! Being a Kokatat I know that it was built to last. This was what a drysuit could be like. I can’t afford a Kokatat unfortunately, so I have gone for another option. But my experience of the Kokatat combined with my girlfriends new purchase of a Kokatat suit of her own has made me re-evaluate my use of such kit. Having given it some thought I really would now prefer to be drier when coming off the river during the colder months. Hence the purchase of the Arch Rival suit from Immersion Research. Choosing which suit to go for hasn’t been easy, but I have been very happy with both the quality and the customer service of IR products in the past. In the UK Immersion Research products are not seen that often on the rivers, despite them now being imported directly into the UK. This is a shame, although selfishly I quite like wearing something different from the sea of blue Palm Torrents that are out there! I put my order down for the suit on Monday afternoon, and it arrived before lunchtime on the following day. 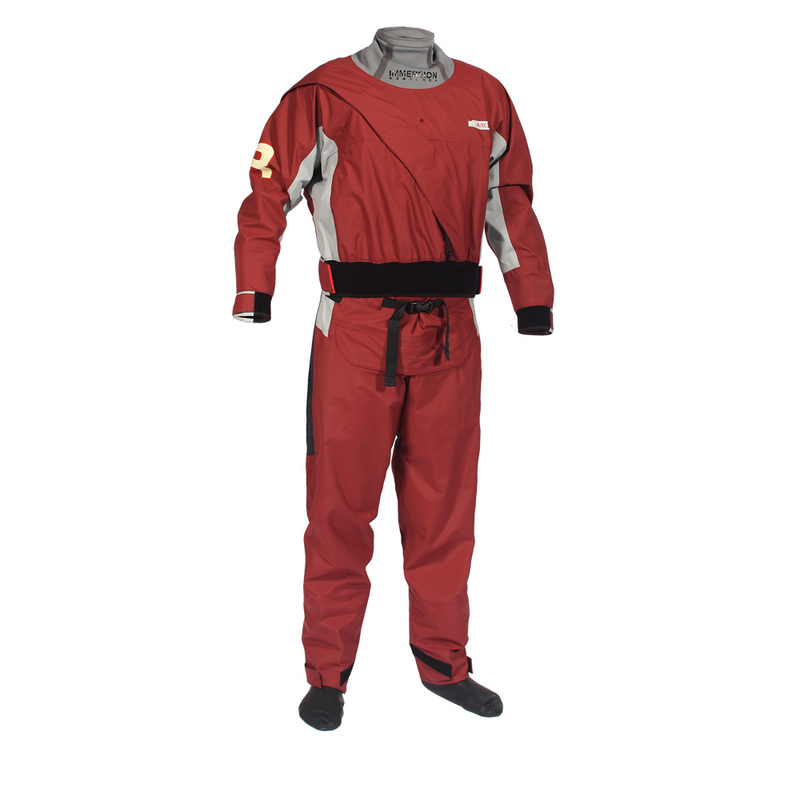 The Arch Rival suit falls into the ‘budget’ category of drysuits in terms of price. However in terms of specification it is the equivalent of some suits that cost a lot more. The Arch Rival is a front/shoulder zip affair, which some people, including myself, may be sceptical about coming from a back zip. More on this later. But to give you an idea of the thought that has gone into the design, the main zip use a flexible TiZip, while the zip enclosure itself is sealed with a secondary zip. This is designed to help minimise any water ingress through the spray skirt. Something that front zip designs are sometimes susceptible to. The material is fairly soft to the touch, and is much lighter than my Typhoon suit. However I have been using a Rival cag for a while now which is made from the slightly lighter version of the same material and it is holding up extremely well, so I can vouch for its toughness. Although time will tell long term! The seat is reinforced with slightly tougher material, although not the Cordora that some other suits use. One area of the Arch Rival suit that may be a sign of its cost effective origins is the lack of reinforced knee areas. But for the price we can’t have everything, especially when the rest of the suit is so well thought out. The boots on the Arch Rival are made from latex, which some may associated with budget suits. I have to disagree with this as I now prefer latex booties to fabric ones. They offer a number of advantages over fabric models. The first is that they are a lot easier to get into shoes, and they are a lot more comfortable once they are in them. Latex booties suffer from none of the bunching that plagues fabric models. If a latex bootie is punctured it is a lot easier to find the leak, and it can be patched up easily with a puncture repair kit. If you are on a long trip or expedition this could be the difference between having wet and cold feet for the rest of your journey or staying dry! Last but not least a wrecked latex bootie can be replaced just as easily as putting a new neck or wrist seal on. This is a huge advantage because with some fabric designs a wrecked bootie means the end of the life of the suit. True, latex deteriorates over time. But not more so than a fabric bootie would anyway through use, and the advantage of being easily replaceable means that you won’t have to put up with gradually more soggy feet as time goes on. A latex bootie either leaks, or it doesn’t. And if it does it can be fixed in minutes. If you really want fabric boots then IR will fit them for a small fee. Other features include velcro tightening at the wrists and on the ankles should you prefer to do so. The neck is a soft touch neoprene cone that unlike other suits easily goes higher than the latex seal, giving it better protection from the sun. Colour wise the Arch Rival is available in four forms. Redwood, the colour that I went for, Classic Green, which was a bit bright for my taste, Jet Grey, which is more like black, and in the slightly less expensive OX suit version, Gull Grey. When I bought the suit I was in two minds as to which size to go for. On paper I was suited to the small size in all but the height recommendation. My Typhoon was a medium and I always felt it slightly too big, with the seals not being the tightest. In fact I had a small neck seal fitted to that suit. However after discussing my dilemma with Mark Mulrain of IR Europe and the guys in the US, I decided to order the medium size one as I was told that the difference in seal size was minimal. The great thing about IR is that they will swap out the seals for a different size quite happily if that is what is required. When the suit arrived and I tried it on initially I found the seals to be nice and tight. Tighter than I have found in medium sizes in other makes. So that was a relief. Putting on the suit was pretty easy. A lot less faff than a rear zip set up. The only tricky part was where the zip goes around the shoulder. It seems to go a bit further around the arm than, say, my girlfriends Kokatat Meridian. The secondary protective zip is a great idea, although the price to be paid is that the zip run as a sealed unit is slightly stiffer and more noticeable while wearing it than the Kokatat which uses velcro patches. But that’s the price you pay for a better seal. The medium size suit is designed for people up to 5’10. I am 5’8 so I am at the bottom of the scale. The length of the suit would suggest that it could happily cope with someone taller than 5’10, but don’t hold me to that! The trouser section of the suit is easily pulled up and then held in place with a really easy to pull webbing belt. There are some people who prefer braces, but I have to say that I am not a fan of them. I find that they can rub under a BA, and if not properly adjusted or they become loose they can fall off the shoulder even while fully kitted up. With a simple webbing belt this means that the top half of the suit is a bit less restrictive feeling than suits that use braces. What about that front zip though? Is it annoying? Carry on reading to find out what I thought about it while paddling. However my initial impression is that I am aware of it being there. It doesn’t get in the way or restrict movement, but I am aware of its presence on my shoulder. The question for anyone thinking of purchasing such a suit is whether it would be annoying enough to offset the advantages such as the ease of donning it, and an easier time pulling a BA on (although the lower profile TiZips most often used these days mitigates this now on rear zip models). Looks wise a front zip isn’t as clean as a rear one. I used to be put off by the look of a giant shoulder pad on one side (I’m usually a stickler for symmetry!) but convenience won the day in my choice, and even with the 2016 rear zip option on the Arch Rival being forthcoming, I think I still that I would have gone for the front zip model, even if that alternative version had been available now. But let’s see what the suit is like during practical use. My first test was on a pretty bleak and rainy day. Getting into the suit was a doddle. Because I was using a playboat I put neoprene socks over the booties before putting them into wetsuit shoes. This resulted in comfy warm feet. I’m not so sure that fabric booties work as well with neoprene socks due to the bunching issues. All zips did up quickly and I was all set to go in a very short time, with none of the yoga antics of trying to do up a rear zip. In the boat the suit moved well with the body, with no feeling of restriction. As per my initial trying on of the suit, I was aware of the front/shoulder zips presence. However as I paddled I forgot all about it. It did not hinder movement at all. I could feel the zipper puller between my lower torso and my BA, though I will have to check that I have flattened it out properly the next time out. This wasn’t really an issue, and it didn’t rub. Just like the shoulder section of the zip I soon forgot all about it and didn’t notice it. The lower half of the suit didn’t pull anywhere and I had the full range of torso movement. The lighter material in general felt much better as a whole than the heavier Typhoon suit I have been using previously. I will be following up this review with more thoughts after I have had a chance to use the suit long term. However my initial conclusions are that the Immersion Research Arch Rival drysuit is one of the best value suits on the market. It is well featured, very well made, and fits and moves well. 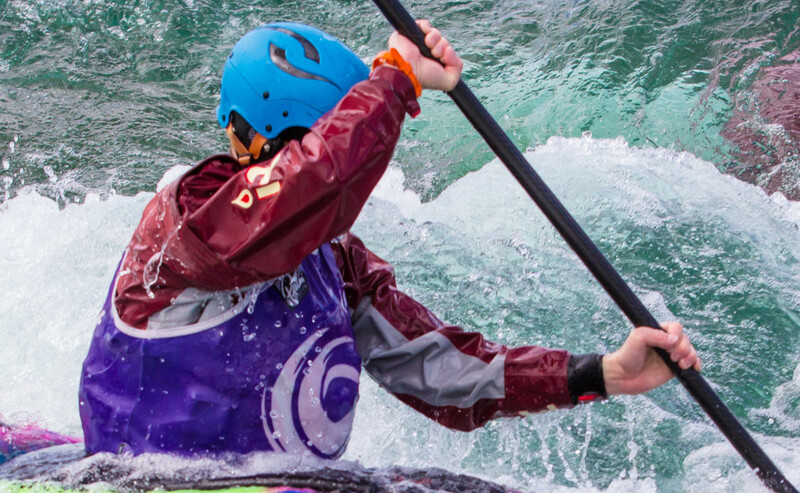 The IR team paddlers, including the likes of Pat Keller, have been using the Arch Rival suit extensively on difficult white water, and that should act as an endorsement for its quality. From a UK perspective it should certainly be a primary candidate. But please don’t buy one just yet as I would like to maintain my individuality for a little while longer! All of IR’s products can be purchased in the UK from Immersion Research Europe. This entry was posted in Gear, Reviews.